Towson men’s lacrosse captured a 13-7 victory over Colonial Athletic Association (CAA) foe Delaware Saturday afternoon at Johnny Unitas Stadium. The Blue Hens (5-7, 2-2 CAA) kept the game tight for the first three quarters, but the Tigers (5-7, 2-2 CAA) had several players step up in the fourth quarter en route to the win. The Tigers got on the scoreboard first, as redshirt sophomore midfielder Matt Sovero punched in an unassisted goal just 30 seconds into the game. The Blue Hens responded with a goal midway through the period, but junior attacker Timmy Monahan ripped in a goal off of a feed from freshman attacker Phil Wies to regain the lead for the Tigers. Towson put in two more goals in the final five minutes of the stanza to take a commanding 4-1 lead, but Delaware squeezed in a shot with nine seconds left in the period to keep the game close. Delaware kept the momentum rolling in the second quarter as they stormed back to knot the score up with back-to-back goals midway through the period. However, Towson redshirt senior attacker Jean-Luc Chetner broke the tie with an unassisted goal with just under four minutes left to play in the half, giving the team a 5-4 advantage going into the break. The Blue Hens entered the third quarter looking to strike as they pushed the pace early on in the period. Their aggressive approach paid off as they put in a goal just under three minutes into the stanza to tie the game once again. 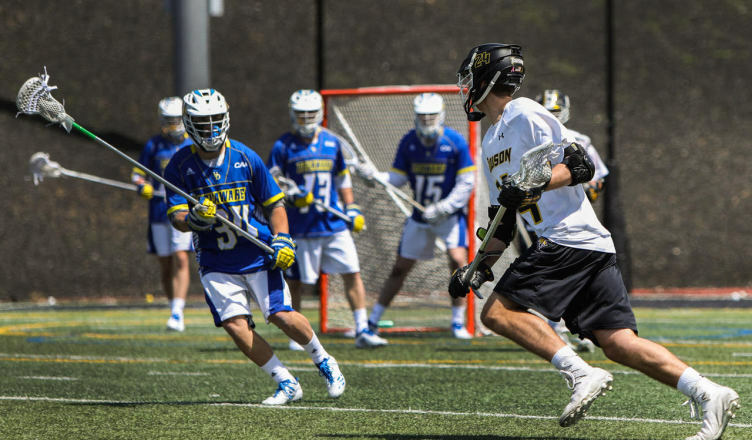 Towson refused to let Delaware get ahead, as junior attacker Brendan Sunday launched in a goal from well beyond the crease to put his team back up 6-5. Despite failing to capture the lead multiple times, Delaware stuck with its fast-paced offensive approach. The Blue Hens used quick passes to keep the defenders on their heels, and capitalized on defensive breakdowns. Later in the game, sophomore attacker Charlie Kitchen put in a short-distance goal off of a feed from freshman attacker Adam Fulton to tie the game 6-6 going into the fourth. Although the Blue Hens had momentum going into the final quarter, the Tigers put together a 3-0 run to kick off the period thanks to good ball movement and dominating time of possession. Junior midfielder Alex Woodall registered nine wins at the faceoff dot in the period. He finished the game with a career best 22 of 24 draws won, propelling his team’s offensive opportunities. Redshirt junior attacker Johnny Giuffreda scored the first goal of the quarter to regain the lead for Towson. Sovero followed with a goal just one minute later, and junior midfielder Grant Maloof scored off of a feed from Wies to give Towson a 9-6 lead. The Blue Hens answered back with a goal, but the Tigers kept their foot on the gas pedal as Sovero notched his 10th goal of the season with an impressive long-distance shot while a defender was shadowing him tightly. Giuffreda and Chetner sealed the win with several late goals with just under three minutes to play. Chetner earned his first career hat-trick on the day and posted a career-high four goals. The Tigers look to continue their strong offensive play Saturday morning when the team hosts Fairfield University on senior day. Game time is slated for 11 a.m.